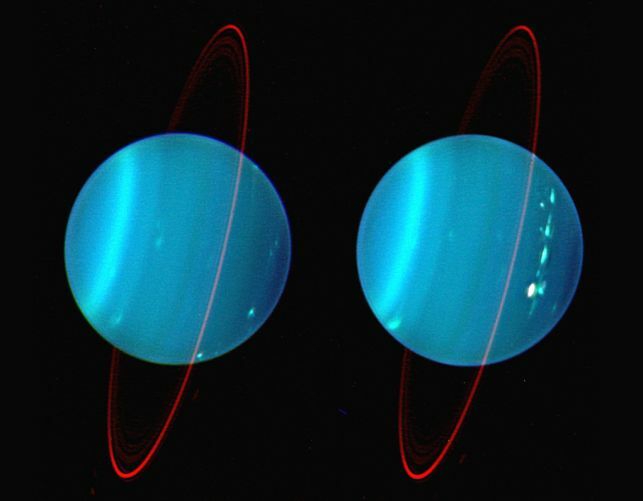 Explanation: These sharp views of tilted gas giant Uranus show dramatic details of the planet's atmosphere and ring system. The remarkable ground-based images were made using a near-infrared camera and the Keck Adaptive Optics system to reduce the blurring effects of Earth's atmosphere. Recorded in July, the pictures show two sides of Uranus (careful how you pronounce that ...). In both, high, white cloud features are seen mostly in the northern (right hand) hemisphere, with medium level cloud bands in green and lower level clouds in blue. The artificial color scheme lends a deep reddish tint to the otherwise faint rings. Because of the severe tilt of its rotational axis, seasons on Uranus are extreme and last nearly 21 Earth years on the distant planet. Uranus is now slowly approaching its southern autumnal equinox - the beginning of fall in the southern hemisphere - in 2007.